At dawn of June 22, 1941, Germany launched Operation Barbarossa, the invasion of Soviet Union. No, not the invasion of Russia. They moved fast, largely because the Soviet armed forces were unprepared, what with the huge purges in 1938, the continuing movement of prisoners east-wards from the Baltic states and eastern Poland and the inexplicable trust Stalin put in Hitler, but they did not reach what we might call Russia for several weeks. By August they were attacking Leningrad and by late November they began the siege of Moscow. Stalin and his mates disappeared from Moscow in June. He did not make a public broadcast till July 3 when he addressed the people of the Soviet Union as "brothers and sisters". According to my mother, who was in Moscow at the time, that caused greater panic than anything else had done. On June 22 the Germans invaded what was eastern Poland or western Ukraine, depending on your attitude, the territory that the USSR had grabbed in September 1939. They then rolled forward, causing enormous losses though Stalin contributed to that in various ways. Nevertheless, the date did turn out to be the first real turning point of the war, the second and more important one being December 7, 1941. It was also a turning point in European history though that did not become obvious except to a few individuals like Evelyn Waugh until much later. Next year will see a couple of important anniversaries: the centenary of the Russian Revolution and the Bolshevik coup, which initiated the existence of possibly the most bloodthirsty political system in history, and the eightieth anniversary of the year that is generally seen as the symbol of Stalin's great purge: 1937. We should devote time to a remembrance and discussion of the victims of Communism. 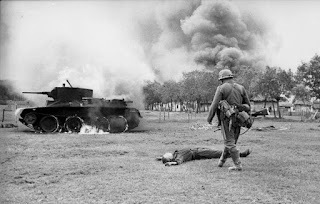 Meanwhile, here and here are links to more pictures from Operation Barbarossa and its aftermath. Further explication of the foresight of Waugh, please. They moved fast, largely because the Soviet armed forces were unprepared, what with the huge purges in 1938, the continuing movement of prisoners east-wards from the Baltic states and eastern Poland and the inexplicable trust Stalin put in Hitler - this canonic Soviet version of events seems to be at odds with many facts and no wonder that it was challenged in recent decades by a number of historians. Still, official Russian narrative goes primarily along these lines. I am sorry, Mikhail, are you saying that the Nazi-Soviet Pact and its consequences or the purges had nothing to do with what happened in 1941? I should have probably edit out a part in your quote related to purges as it appears to be unobjectionable. What is very questionable is the assumption that Soviet army was unprepared. All known facts suggest that Stalin had not only had by far the strongest military force in the world, but, as some argue, it was even more powerful that all the other armies on the European continent combined. According to some scholars, Stalin in fact was preparing to attack Nazi Germany with the strategic plan to conquer the whole Europe, and such a catastrophic defeat that he took in the first months of war was only possible because almost all the Soviet forces were either concentrated in vast amounts along the western border deploying for action, or en route which both rendered them extremely vulnerable for a preventive attack. I was sure that you were familiar with the theory, most prominent advocate of which, former GRU officer Victor Suvorov is residing in the UK. Sorry about not replying yesterday, Mikhail. Too taken up with other matters. I am, of course, familiar with Suvorov's "icebreaker" theory and have even heard him speak on the subject. He was not totally persuasive but that may have had something to do with his ridiculous lecturing style. More to the point, historians who know more about the subject than I do find him not entirely persuasive. However, you are right in that I ought to have mentioned it on the blog. I shall have a look at the link and add a comment to the blog, pointing out that there are alternative theories to the more common one. Ironically enough, in Russia, Suvorov's books are seen by official propaganda as a part of West's information war against it designed to whitewash Hitler and diminish the role of the Soviet Union in defeating Nazi Germany, while in the West itself his books are frequently under-rated. In follow-up to the initial Icebraker he produced a number of books (specifically Day M and The Last Republic) where he elaborates his theory significantly deeper. And, above all, it is a gripping and fascinating read, so I'd highly recommend you to have a look. It should be widely available and chances are you won't be disappointed. The strength of his books is that they're based entirely on the open sources with references and proven facts to support virtually every point he makes, so everyone's free to take his arguments to the test. Apart from him there is a growing number of authors who go along the same lines - Mark Solonin is a good example, which I'd highly recommend, too. Combined they draw a picture that paints Stalin rejime much gloomier than it is widely recognized and, in fact, put all the elements of the big puzzle in their places. Could we stop underestimating John Buchan?